This sophisticated Notary Desk Seal is guaranteed to meet all state specifications for notary supplies. We back this desk embosser up with a lifetime warranty from our company because we are confident you'll never have an issue with its superior parts. Questions regarding this product? Contact Us to find out if this is the correct product for you. Many notaries are stationary and require their clients to come to their offices. 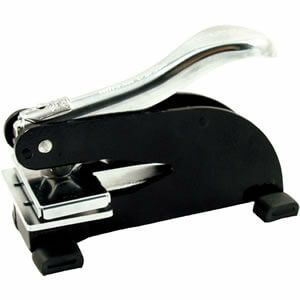 This is a must-have tool for those who prefer to have their notary seal proudly displayed on their desks. With a heavy-duty frame and rubber grips on the bottom to protect your desk, this embosser is sure to get the job done! Just a push of the handle generates a clean and clear impression every time. Can we help you with this product? Drop us a line today for a free quote, or to get your questions answered - we're glad to provide personal assistance to you. IS A NOTARY DESK SEAL RIGHT FOR ME? If you love the look and feel of an embossed seal but dislike the hassle associated with traditional hand embossers, this Notary Desk Seal is the correct product for you. This small unit packs a punch and decreases the force needed to receive a crisp clean imprint every time. This desk embosser is black and chrome in color and even has rubber sleeves on the feet so you can proudly display this on your desk without worrying about scratches.